Asbestos is the name given to a group natural occurring minerals. It became widely used because of it's resistance to heat, fire and non-conductivity of electricity. Thus it has been extensively used in many building materials. The truth is I spent very little time in the basement and I can't really remember playing with the stuff... So am I Ok? Probably not. Along with my childhood experience, I've worked my whole life in the construction trades...I've seen and worked around it many times. 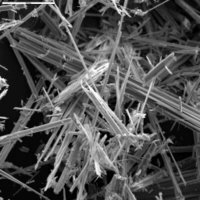 The highly politicized controversy in Washington over asbestos litigation has overshadowed a quiet and directly related crisis in public health: an epidemic of diseases in the United States that claims the life of one out of every 125 American men who die over the age of 50. -- a rate approaching 30 deaths per day, according to a detailed analysis of government mortality records and epidemiological studies by the EWG Action Fund. It kills thousands more people than skin cancer each year, and nearly the same number are slain in assaults with firearms. The suite of diseases linked to this exposure overwhelmingly affect older men. An authoritative environmental health website. Would you like to pursue legal council concerning this issue? There are many specialized law firms that deal with this and other environmental issues. Many offer free consultations. Directory of attorneys that specialize in asbestos exposure and other environmental toxins.